Do you know who is picking your fruits and vegetables? I bet you wouldn’t think that children as young as 5 are working the farms and fields that supply your grocery stores. I bet even more that you wouldn’t think the farms and fields I am referring to are in the United States. The truth is that an estimated 500,000 children are working on farms throughout the U.S., not on small family farms, but on large commercial farms that supply grocery stores around the country. What is perhaps most shocking is that this exploitive practice is often recognized as legal under U.S. labor laws—when children are less than 12 years old. Child farmworkers are America’s hidden secret. When we think, talk or hear about child laborers, we are most often referring to those in countries other than our own. Investigative reports have revealed very young children working in hazardous conditions on fields across the country. ABC News went undercover a few years ago at Adkin Blue Ribbon Packing Company, a blueberry farm in Michigan, revealing several children picking and lugging heavy buckets of blueberries on the commercial farm. The farm was a supplier to Walmart and Kroger but the grocery chains severed ties once the use of child laborers was brought to the surface. In June, the U.S. Department of Labor found child laborers between 6 and 11 years old working in three separate Washington strawberry farms. These investigations, however, do not include the dozens of other children likely working the farms below 18 years of age since it is not illegal for children 12 years old and older to work unlimited numbers of hours in the commercial agricultural industry—a major loophole in U.S. labor laws and an extremely questionable moral issue. The conditions that U.S. child farmworkers endure are dangerous and exhausting. Unfortunately, the agricultural industry is often viewed as less dangerous than other industries for children to work in. Due to this misperception, exemptions in the law, oversight and lack of enforcement of current law and low level public attention contribute to the continued exploitation of children on farms. Child farmworkers are four times more likely to experience fatal injuries than all other forms of child labor. Some of the common physical ailments child agricultural laborers experience include dizziness, nausea, rashes, vomiting, and headaches. The children are repeatedly exposed to poisonous pesticides and harsh weather conditions, as well as regularly use sharp tools and heavy machinery. Long-term consequences of pesticide exposure include cancer, brain damage, and memory/learning difficulties. Work environments often do not provide access to sanitary facilities such as restrooms or a place to wash hands. Access to safe and abundant drinking water is not always available. Education is often not an option for these children, dropping out of school at a rate four times higher than the national average. Children often pick and carry 200+ pounds of fruits and vegetables per day, working an average of 10-14 hours per day, 60+ hours per week, and 7 days per week. 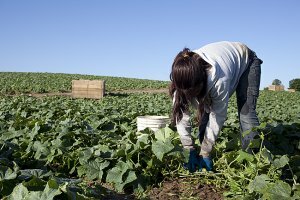 The plight of U.S. child farmworkers is difficult to sum up in one blog post. The legal, social, educational, physical, emotional and moral implications are many and complex. The reasons why children get involved in agricultural labor vary, but many come from families living below the poverty line. Some work because they are the only able-bodied in their families to do so and some work alongside their families. The wage farmworkers are paid is not often by the hour, but by how many berries they pick—a wage that is often way below minimum wage and nearly impossible for families to live on. Hence, children are often brought in by their parents to pick more berries with their efficient tiny fingers. Human Rights Watch’s Deputy Director, Zama Coursen-Neff, stated that the U.S. is a developing country when it comes to their child agricultural labor. I would agree. The United States needs to do more to protect children from the extreme conditions they are forced to endure in the agriculture industry. In my next blog post, I will discuss some of the current initiatives taking place to address this issue, suggest some best practices, and recommend changes to protect children farmworkers in the U.S.
Cynthia Castaldo-Walsh is a Program and Research Intern with the SISGI Group focused on gender-based conflict, non-violence and peacebuilding for conflict transformation, and sustainability for conflict resolution. Cynthia Castaldo-Walsh is a doctorate student at Nova Southeastern University studying Conflict Analysis and Resolution, with a concentration in International Peace and Conflict. She holds a M.A. in Mental Health Counseling from Iona College and a B.S. in Psychology from the State University of New York College at Oneonta. Her primary areas of interest include gender-based conflict, nonviolence and peacebuilding for conflict transformation, human rights and empowerment, and sustainability.